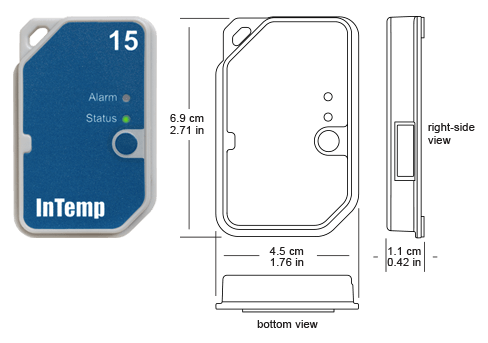 InTemp is a seamless temperature monitoring solution for the storage and transportation of temperature-sensitive products. 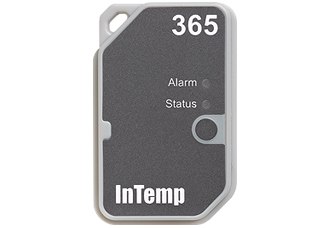 It reduces excursions by providing accurate, secure, and actionable temperature data at the click of a button. 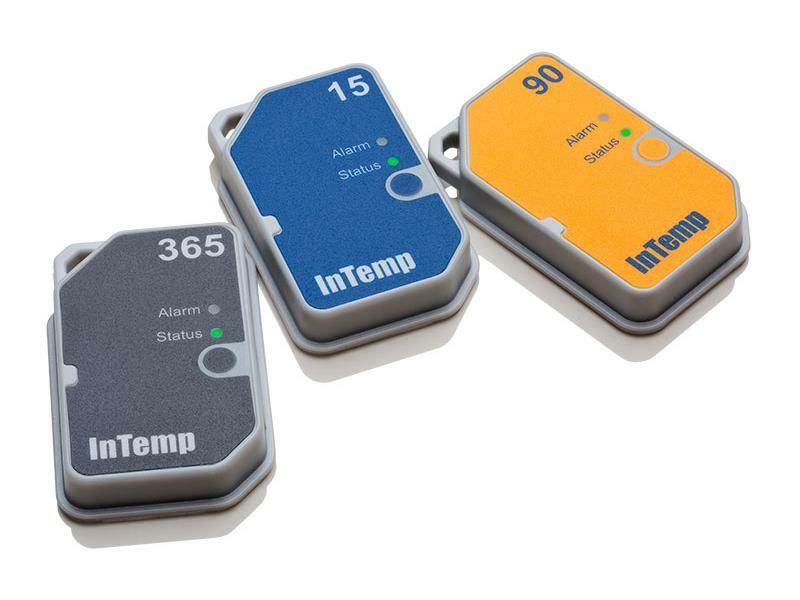 The InTemp CX500 Bluetooth® Low Energy data loggers are single or multi use loggers that records temperature data. 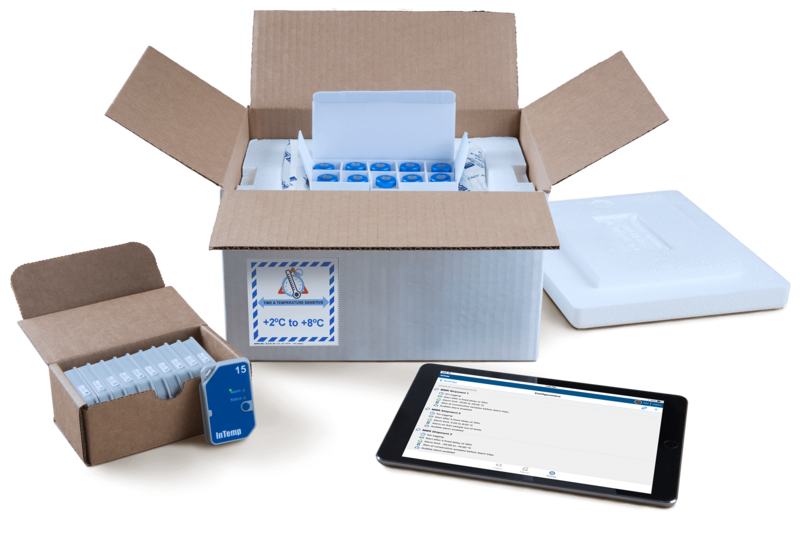 Designed for Cold Chain and CRT Shipments, the CX500's are ideal for parcel shipments, clinical trials, and expedited risk pharmaceutical shipments. Using the InTemp app on your mobile device, you can easily configure the CX500's with one of multiple preset configurations, or set up a custom configuration. The logger has a built-in alarm to alert you to excursions. And logger reports can be quickly downloaded to your phone or tablet and uploaded to an InTempConnectTM account, where you can analyze and export data as needed. 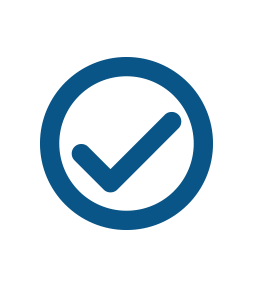 A 3-Point Certificate of Calibration, provides assurance that the data can be trusted when making important product-disposition decisions. 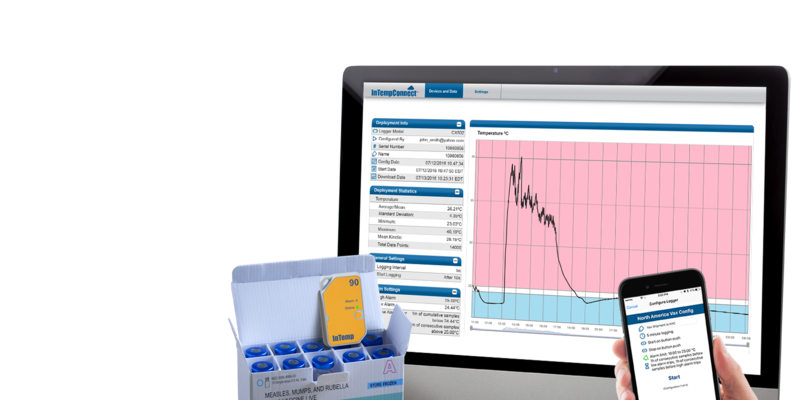 Together, the InTemp CX500 data logger, InTemp mobile app, and InTempConnect cloud-based data warehousing service offer a seamless temperature-monitoring solution for Good Distribution Practices in the pharmaceutical supply chain. Each InTemp CX500 logger is clearly marked with the number of days the logger will last: 15, 90, or 365 days. The loggers have up to a one-year shelf life and use one non-replaceable lithium battery. 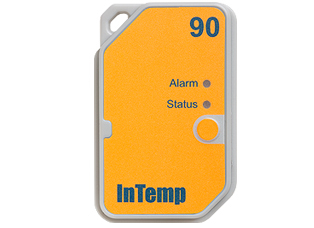 InTemp CX500 Series loggers have alarm and status LEDs , enabling you to quickly identify logging status and any potential temperature excursions. The CX500 Series loggers have an accuracy of ±0.5°C from -5.0°C to 50°C to satisfy Global Good Distribution Practice accuracy guidelines. Compact CX500 loggers (roughly ~25 grams) are ideal for use in temperature-controlled shipments where payload size and weight have a significant impact on the cost of shipping the pharmaceuticals. The CX500 communicates wirelessly via Bluetooth Low Energy (BLE) to the free InTemp app on a mobile device. 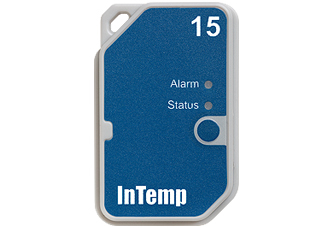 This reduces setup and readout times, enabling logistics and quality personnel to access temperature data without ever opening a box. With a quick tap of a button, operators can document trips and obtain actionable information, enabling more proactive product-handling decisions. The InTemp app syncs easily with the InTempConnect cloud-based data warehousing service, which provides command-center control over the supply chain. This fully-integrated solution ensures secure electronic records and a reduced paper trail, streamlining the audit process and prioritizing quality delivery of goods. 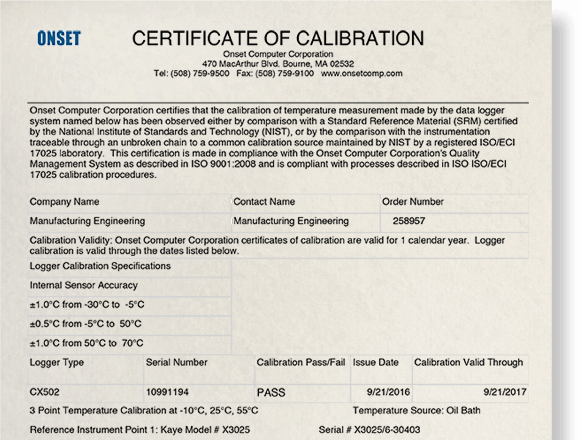 Each logger is calibrated at three different points and includes a Certificate of Calibration valid for one year from data of purchase, ensuring companies can trust their data and make informed product-disposition decisions. Certificate is valid for 12 months from the date of manufacture. To see the full specifications for this product, please see our product manual found under the PDF documentation above. CR2032 (CX501) or CR2450 (CX502 and CX503) 3V lithium, not replaceable. Battery for CX501 and CX502 lasts for duration specified when logger is used within the 1-year shelf life. Battery life for the CX503 model is 1 year, typical with logging interval of 1 minute. Faster logging intervals, remaining connected with the InTemp app, excessive downloads, and paging may impact battery life. 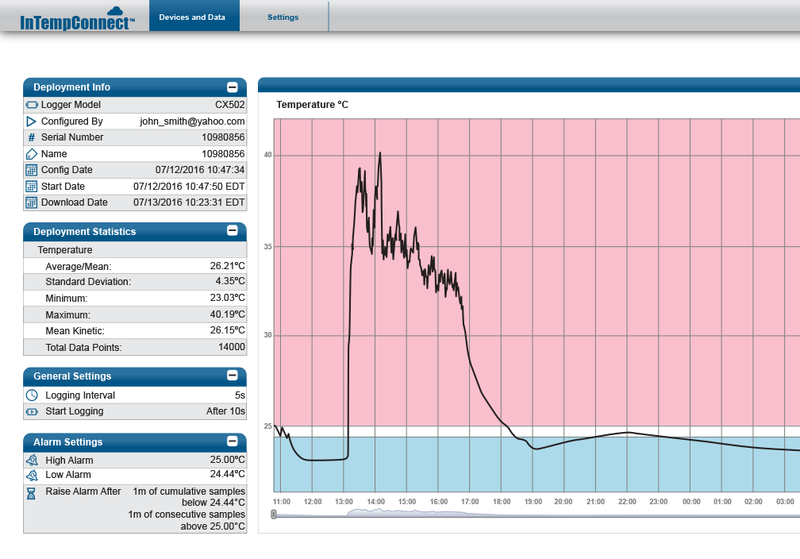 Using the InTemp mobile app, local users download data from InTemp loggers to a phone or tablet. 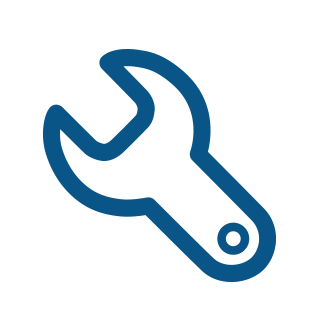 Reports are automatically uploaded to the designated InTempConnect account where data can be analyzed from a central location or integrated with ERP or business management systems. 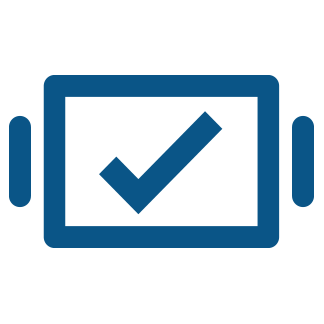 Your InTempConnect account is automatically locked with an encrypted passkey, and only users designated by an administrator are able to connect to it, ensuring secure electronic records. 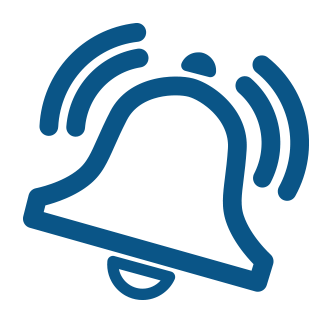 View all your data within InTempConnect, including deployment data, graphs of logged data, user activity, alarm information, and more. Generate Secure PDF and XLSX format files for easy export, simplifying regulatory compliance. 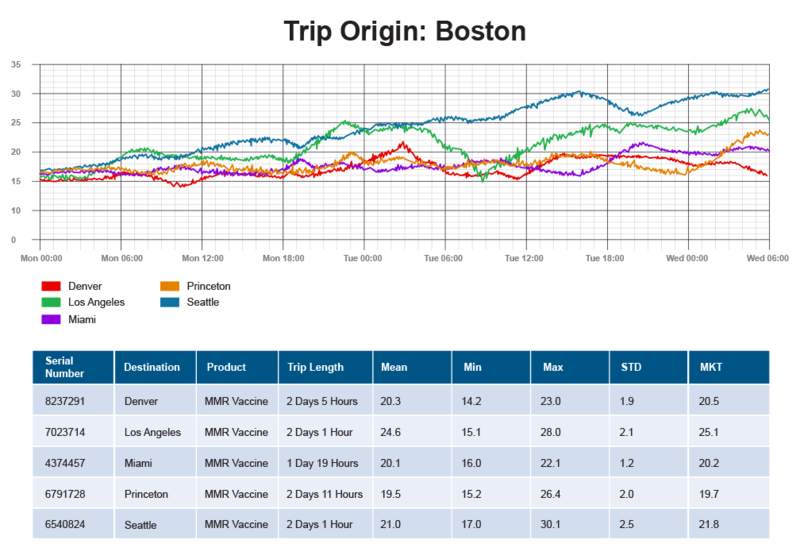 Quickly assign trip information such as destination, product, or shipping methods from your mobile device during logger deployments. Decision makers can review filtered trip and supply chain data and view pertinent KPI reports instantly or at scheduled intervals. 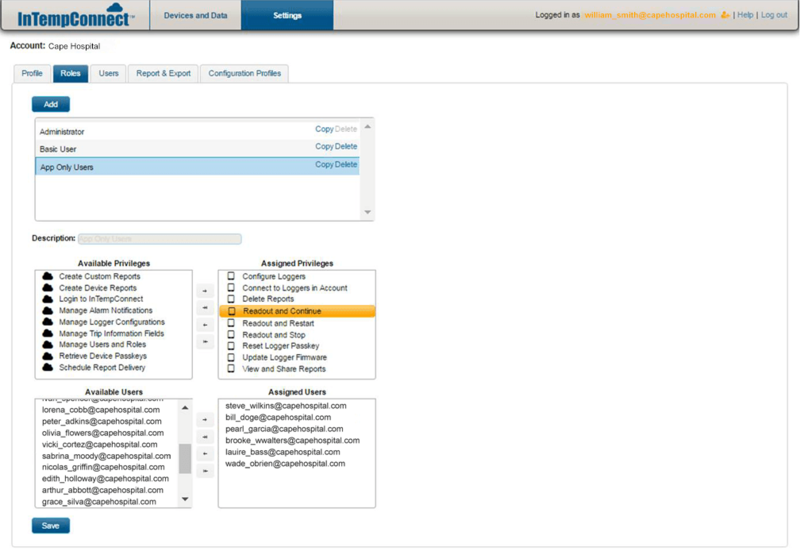 The free InTemp app makes it a snap to configure and read out InTemp loggers, and automatically upload reports to the InTempConnect cloud service. 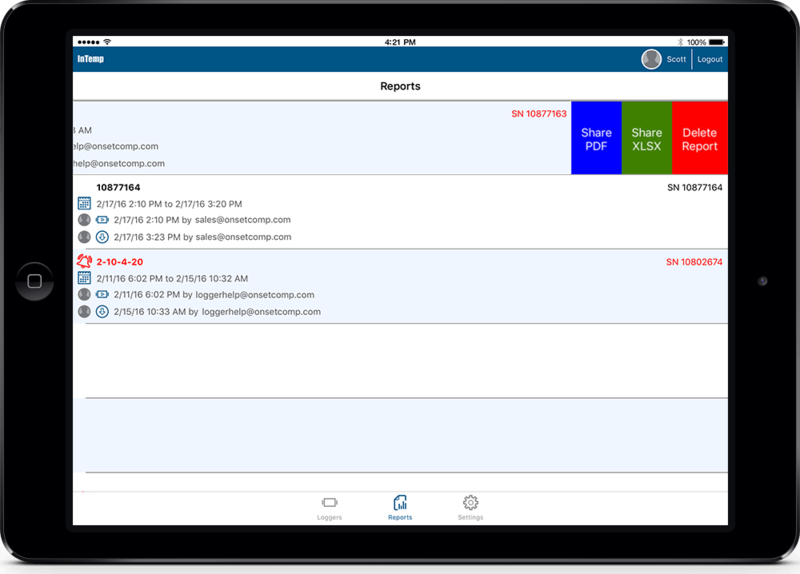 View data, check logger status, set alarms, and create and share secure PDF reports to streamline reporting and compliance. 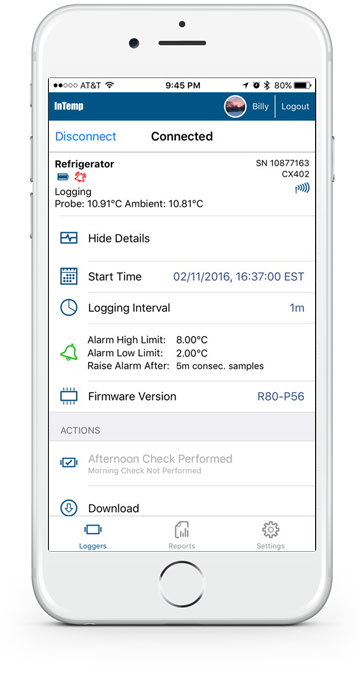 With the app, you can choose from preset configurations (for refrigerator, storage, freezer and more) or create your own configuration for other monitoring applications. To keep things secure, you can set an encrypted passkey that other mobile devices will require for connection to the logger. See details about the current logger deployment, including start time, logging interval, alarm limits, and if a daily check has been performed. Additionally you can configure and start the logger, download the recorded data, page the logger and set a passkey. 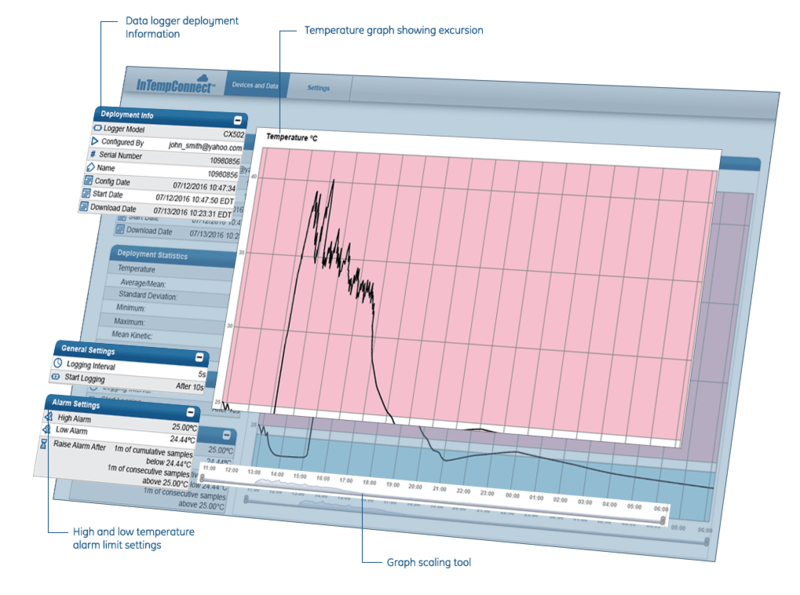 A CX logger configuration contains the logging interval, logger start time, and alarm settings. Select from multiple default configurations or create your own custom configuration. All CX loggers have an LED indicator that blinks red when temperatures exceed high or low thresholds. CX400 models also have an audible alert. Performing daily checks of CX400 loggers is as simple as connecting to the logger and tapping Perform Morning or Afternoon Check.You can also set a reminder in the app for the morning or afternoon. 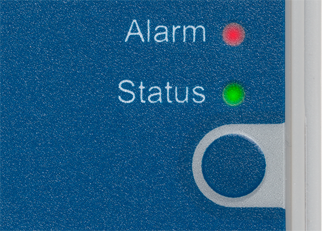 The Loggers screen in the InTemp app displays loggers within range in a list sorted by alarm status. Each row in the list represents a single logger, and displays key information such as the deployment name, battery power, status, sensor readings, serial number, and signal strength. 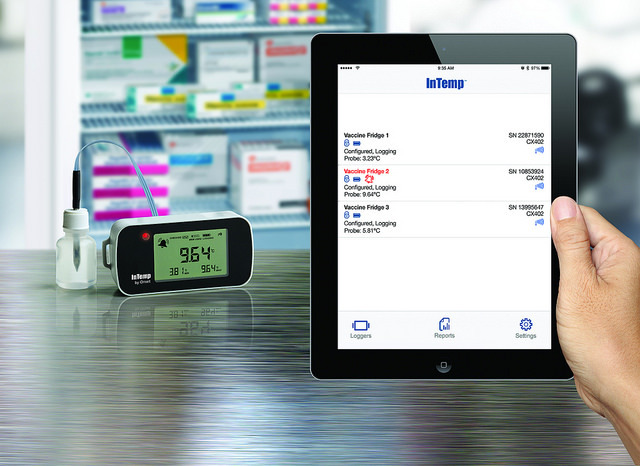 The InTemp App automatically syncs with the InTempConnect cloud-based service, which provides command-center control over the supply chain. A secure PDF or XLSX report will give you information about when the logger was started and downloaded, a summary of any alarm excursions, a graph, min/max/average temperatures, and an audit report table that shows when and who connected to a logger.